As everybody knows today, IoT is a great opportunity to innovate and create value for companies. IoT innovation first impacted end consumer markets with high volume gadget successes and also some memorable flops. Remember that 75% of IoT projects are commercial failures, and you surely want to be part of the 25% remaining. How IoT innovation can bring value to your company? The IoT wave can now enable positive business outcomes in the industry and that’s where things become really interesting. IoT can be an opportunity to create growth in all fields, be it automotive, medical, handheld, etc. but there has to be thought put into design/development because of numerous interconnectivity standards and legislations. IoT innovation can change your business and help you create value for your company in many different fields: processes, products, etc, but there is also a high risk that it leads you nowhere if you forgot some factor in the game. It is time for IoT maturity. It is key for the success of your IoT innovation that you, as a manager, project yourself in the different key success factors areas and check if you are ready to make it. Our IoT maturity scaler will allow you to spot out in which areas you are strong and where your project has weaknesses. Our IoT maturity scaler has been designed to help you identify how robustly developed your project is and where you need to intensify efforts for your IoT innovation to be a success. 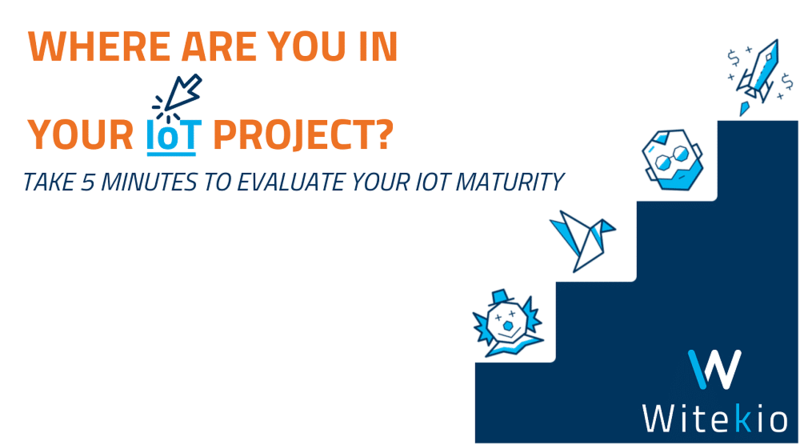 In 15 questions, which is roughly 5 minutes of your time, you will find out to which of our 5 Iot maturity stages you belong to and what actions we can advise to help you build your project on solid ground rather than sand. Get our full report and identify areas where you need to dig into. Check where Witekian software experts can help you make sure your IoT innovation project is not just a dream but can become a reality. For example you might find out that you are at an “Early bird” stage. In short (you will see much more in our full report), it means you will need to dig into various areas of your IoT innovation idea. This will lead you to your first POC to test and validate your ideas and maybe start again, as innovation is often an iterative process. For more than 15 years, Witekio has dedicated itself to embedded software. The result is 2000 projects implemented on 3 continents (EMEA, North America, and ASIA). Our expert engineers understand the stakes and can help make your IoT innovation a success. We accompany your projects from hardware to the cloud, bring added-value into architecture, design, expertise and development of all software layers for your embedded or IoT device. We can help you build your first POC (Proof of Concept), give you advice on how to move from POC to industrialization. We will help you anticipate your system’s future and make it stable, secure and scalable. We have an extensive experience in connectivity, be it between devices or to the cloud. We master interoperability challenges and will also help you identify key security stakes of your project like authentication management or OTA update. We can help to improve your IoT maturity and make sure your IoT innovation turns into a best seller.